Just like your teeth, if too much plaque and bacteria are allowed to build up on the gums, they can actually develop an infection called periodontal disease. You probably know it as gum disease, and it can have far-reaching effects for both your oral and overall health. Redness, swelling, and minor oral bleeding are early symptoms, and this can eventually turn into gum recession, bacteria filled pockets in the mouth, loose teeth, and ultimately…tooth loss. 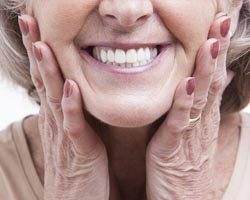 Periodontal disease has also been shown to have a strong connection to a variety of whole-body problems, including diabetes, stroke, heart attack, and even dementia! Needless to say, Dr. Twohig and our team take gum health very seriously, which is why we offer periodontal disease treatment in Weyauwega that’s designed to find and remove infection as quickly as possible. As always, our goal is to take the most conservative approach in order to preserve the strength and integrity of the gum tissue. If we’re able to catch a patient’s gum disease early enough, a scaling and root planing treatment is often all we need to take care of it. 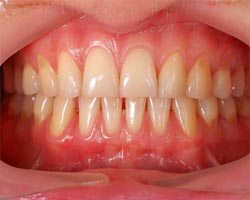 These techniques provide a kind of dental cleaning that is specifically focused on the gum line and roots of the teeth. First, a small scaler is used to break up and remove any plaque and tartar deposits accumulated around the gums, and then the roots of the teeth are gently reshaped and smoothed out. Why? Because this makes plaque and bacteria less likely to gather near the gums in the future, lowering the chances of reinfection. For cases of more advanced gum disease, our diode soft tissue laser enables us to quickly and painlessly remove bacteria from below the gum line as well as any infected tissue. Laser treatment is extremely precise and gentle, and most patients experience little to no swelling, bleeding, or discomfort during or after a procedure. Gum recession is the result of periodontal disease bacteria breaking down the soft tissue of the mouth, which can cause it to pull away from the teeth. This not only makes the teeth appear unnaturally long, but it also exposes the sensitive enamel located around the roots. In the past, the only way to correct this problem involved a painful gum graft, but thankfully, we’re able to offer a much more comfortable solution. With the Chao Pinhole Technique, a small hole literally the size of a pin is placed into the gums, and then special tools allow us to slowly stretch and massage the gum line back into its original position. No scalpels or sutures are needed, and patients can look forward to a safe and effective procedure that delivers noticeable results immediately. Ozone is simply enriched oxygen, and by exposing it to the gums, we can eliminate bacteria in the gentlest way possible. Ozone therapy also increases blood flow to the gums, which helps them heal and fight infection on their own in tandem with any other treatments we provide. 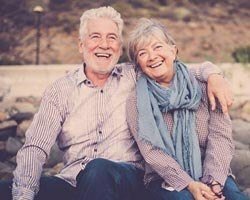 It’s one of the least invasive and most direct ways to take care of a patient, and we’re one of the few practices in the area who offer this type of periodontal therapy in Weyauwega.